Liver sinusoidal cells (LSEC) are forming a barrier between circulating blood and hepatocytes. Many viruses, like the adenovirus (Ganesan et al. 2011 ) Rating=2 or herpesviruses seem to be unable to cross that barrier. 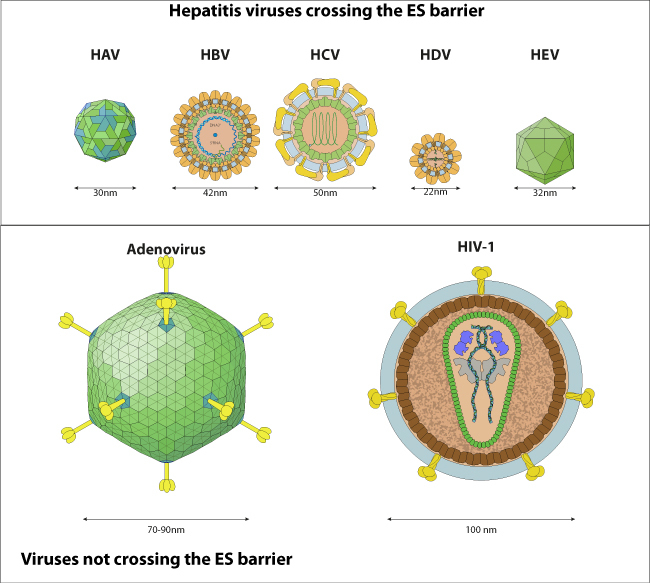 Hepatitis virus A to E are all among the smallest virus in size. They may cross the LSEC barrier passively through the fenestrae which size vary but would be about 100nm in human. Adenoviruses would not be able to pass through fenestrae, and they are about 80nm in size. An active transport by LSEC would also be possible. Indeed HCV would bind L-SIGN and DC-sign on LSEC, thereby facilitating transmission to hepatocytes (Lozach et al. 2004 ) Rating=2. DHBV particles have been shown to be captured by LSEC, a process that may carry on the virus to the space of Disse by transcytosis (Breiner et al. 2001 ) Rating=2, or the captured viruses may be also neutralized.